In the largest building energy bench marking measuring process ever to occur, New York City commercial property owners are learning how their building stacks up against comparable buildings on a standard 1 to 100 percentile basis. Those scoring less than 75 will normally seek to improve their grade by upgrading to more energy efficient equipment. Landlords with less than 75% grades will be at a competitive disadvantage compared to higher performing buildings. After all, one cannot charge a fair market rent for a below market performing building. Large EPAct tax savings are available to the large buildings, subject to the mandatory energy benchmarking. The resounding success of the Section 179D government building designer incentive is encouraging and supporting extension of the current law, along with interest in a proposed "deep retrofit government building designer tax provision”. On September 21, 2012 Senators Snowe, Cardin, Bingham, and Feinstein introduced a new law. With this proposal, the tax benefits under current law along with Section 179D will increase from $1.80 to $3.00 per sq. ft. This is coupled with a new Section 179F, providing deep retrofit tax incentives of $4.00 per sq. ft.
Big data refers to the concept of large amounts of information being used to analyze trends and create future strategies. The massive amounts of new comparable data from energy benchmarking jurisdictions are enabling some very innovative ways to analyze and present the building energy benchmarking results. An organization called Honest Buildings has amassed a large collection of building related data including energy consumption related data. In fact the federal government has designated big data related to energy usage as one of the top big data opportunities. Even using a low passing rate of 65, the median New York City building has a failed rating of 64. Using the normal 75 rating to achieve Energy star status, the median NYC building performs 15 percent below the Energy Star level. 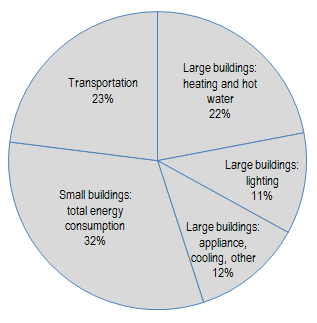 The New York City Local Law 84 Benchmarking report (see table above), which summarizes the data, found that if all comparatively inefficient large buildings were brought up to the median EUI in their category, the energy consumption in the city’s large buildings could be reduced by roughly 18 percent and greenhouse gas emissions by 20 percent. Large buildings are responsible for 45 percent of New York City’s carbon emissions, the report said. Larger office buildings were found to use more energy per square foot than larger ones. The most common building upgrades that will markedly improve benchmarking results are energy efficient lighting and energy efficient HVAC. Energy efficient lighting is normally considered the investment that will yield the best economic payback meaning that the investment will pay for itself in the shortest time period. Many New York City buildings particularly offices, retail, hotels, restaurants and apartments are installing long life low wattage energy efficient LED lighting to reduce operating costs and improve benchmarking results. With air conditioned buildings, the largest building energy cost related equipment is air conditioning. Installing energy efficient air conditioning will typically result in the largest benchmarking percentage rating improvement. The 2010 NYC Benchmarking Report concludes that targeting the office building sector for energy reduction makes the most sense “because so much energy is used in relatively few buildings.” These office buildings can use large EPAct tax incentives to improve their existing building energy benchmarking results.